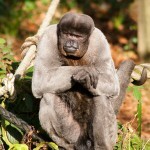 Lily was born on 18th October 2014, to woolly monkey Maya; but her birth wasn’t exactly planned! Sadly, Maya passed away due to old age related health-problems, but happily all of the males want to care for and protect her now. Ollie in particular adores her and they are very close. 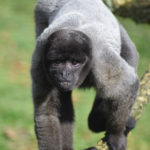 Lily is still learning everything she needs to know about being a woolly monkey and it is great to see her benefiting from a social group. Oliver is a popular member of the woolly colony. He is an adventurous character who is always foraging and exploring. He loves to play, swing, jump and see how much he can get away with around the other monkeys. Ollie has strong bond with Lily, who absolutely adores him. Despite the loss of one of his legs, Ollie has a determined and energetic nature that sees him enjoying his life to the fullest! 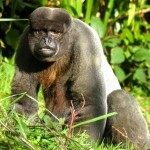 Pablo is a handsome and healthy male woolly monkey. Pablo is part of a powerful family group and has a nephew called Ollie and a young niece called Lily. He is often found in the highest tree-tops of the ‘Trees’ enclosure where he enjoys climbing and leaping. Pablo is very strong and confident but is also a good friend to his niece and nephew.